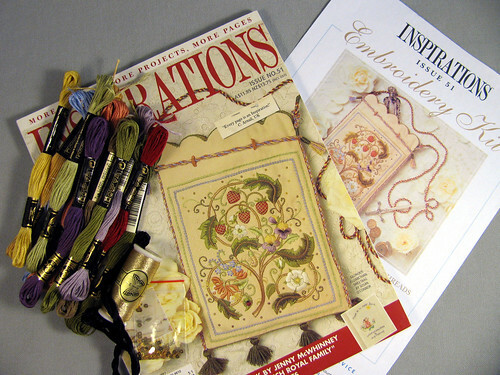 I fell in love with the embroidery design on the cover of “Inspirations” #51 magazine. It was at the time I was getting started with embroidery. Then during the Country Bumpkin winter sale I noticed this kit was a price I could afford. They also had a couple of their wonderful A-Z books with a sale price that made the shipping costs vanish. It was a big deal for me to order supplies from Australia, so much so, I have been scared to start on this beautiful bag. Not only that, but the fabric is silk and the first instruction is to dip it in an instant coffee solution for 5 minutes, then sprinkle more instant coffee on the surface and wait an additional 5 minutes before rinsing. I think I could really mess it all up. So I have been procrastinating. I want to stitch the strawberries with the gold lattice work on top. There are also these cute little hand made metal sequins, not really sequins, they look like tiny jump rings that have been hammered flat. So real metal and heavy for their size. I need to design the back since it is calls for the stitcher to design her own monogram. I am writing this blog to keep me motivated, and the pressure of finding something to post about daily should help. Now where did I put that instant coffee I bought during my mom’s last visit? This entry was posted on Saturday, November 15th, 2008 at 3:00 am and is filed under Embroidery. Tagged: Embroidery. You can feed this entry. You can leave a response, or trackback from your own site.